The South South zonal elimination ahead of the forthcoming 19th National Sports Festival may have come and gone, but the impression its created was a disappointing and ugly one. The elimination which started from Tuesday to Thursday, took place in Asaba, Delta State, and was not anything to go by. A situation where States mobilized their athletes and officials to Asaba in the name of elimination competition of National Sports Festival which is slated for December later in the year, but on getting there, it was nothing to right home about due to bad treatments of visitors, alleged irregularities and bad officiating of almost all the games. Joining Akwa Ibom State contingent which was made up of 74 athletes and 24 officials to the elimination competition, afforded me the opportunity to see things for myself. The officiating was in favour of one State. It was unfair situation for Team Akwa Ibom and Delta State (the host State) was always dominating. Out of nine games, Team Akwa Ibom competed in five namely: Football (male), Handball (male), Beach Volleyball (male and female), Cricket (male and female) and Basketball. Some factors worked against Team Akwa Ibom at the competition. Many thanks to Beach Volleyball team for being the only team game to qualified the State against all odds. Going into details, Team Akwa Ibom arrived Stephen Keshi stadium in Asaba late in the night on Monday. The contingent after waiting for about two hours were led to where they would camp (NYSC orientation camp, Issela – Uku). A bushy place without constant electricity power supply and could take one almost two hours on the road before getting to Stephen Keshi stadium in town, where most of the games took place. Alleged bad officiating and irregularities marred the entire games and the aim of the elimination games was defeated as some States had to registered their protests. It surprised everyone that ordinary preliminaries of National Sports Festival, only one State out of five participating States celebrated victory at the end. The elimination was full of humiliation and operation and a must win at all cost. This also led to influening officials’ decisions, protests and abandonments of some games, to an extent that the final game of female handball could not hold because of protest. The worst happened in football game between Akwa Ibom and Bayelsa at the Jay Jay Okocha stadium, Ogwashi Uku. The centre referee used his power through his whistle to frustrate Akwa Ibom. He awarded “three” controversial penalties in favour of Bayelsa. The game ended, Akwa Ibom 2 : 3 Bayelsa. I’m not even talking about the para-soccer game between Rivers and Bayelsa which ended in a very hot fight. Imagine Disabled people exchanging heavy blows at each other which lasted for about 10 minutes because of alleged poor and one sided officiating. They carried generous objects against opponent players and some even got wounded. The mother of all fights happened during the final basketball (male) game between Delta and Rivers. Fight erupted when Rivers players noticed that the referee was in support of the host State (Delta). All spectators inside the hall had to run for thier lives when the situation was beyond control. The camera man that was covering the game was beaten up seriously and his camera got impounded if not for the intervention of the police who came to the rescue, the fight would have escalated to something else. His camera was released to him later in the day. As it stands now, if the situation is unsolved, South South may not have representative in basketball (male) in the National Sports Festival. My little advice, first goes to the organisers of the elimination competition (Delta State). It shouldn’t have been a must host and win all games competition. It was all clear that everything was working in the favour of the host State. Secondly, days for the games were not enough for the competition. How can such magnitude of competition be organised within 3 days? You can’t have the best out of it. One week should have been better. 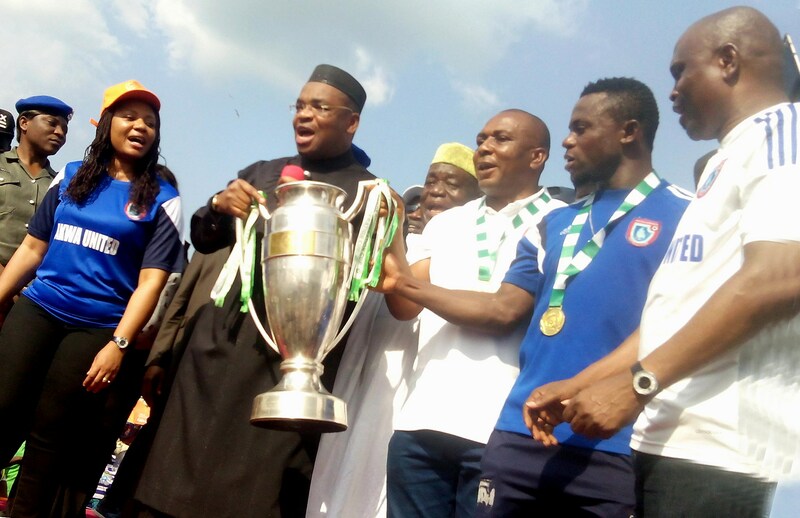 To Team Akwa Ibom, they did to the best of their abilities. They tried to have qualified the State for at least Beach Volleyball Male and female. I saw what they passed through. Both the Akwa Ibom State Ministry of Youth and Sports and the athletes ought to have prepared well for the elimination competition before going. Nevertheless, the Ministry of Youth and Sports should understand that the main National Sports Festival that is coming up on December is expected to feature professionals and world class athletes and therefore they should start now to prepare. From what happened at the elimination, is now clear that the festival will not be a kiddies competition.